Our own dpeg and Lasty were interviewed in Rock Paper Shotgun! Have a read and learn a little about Crawl’s development process. 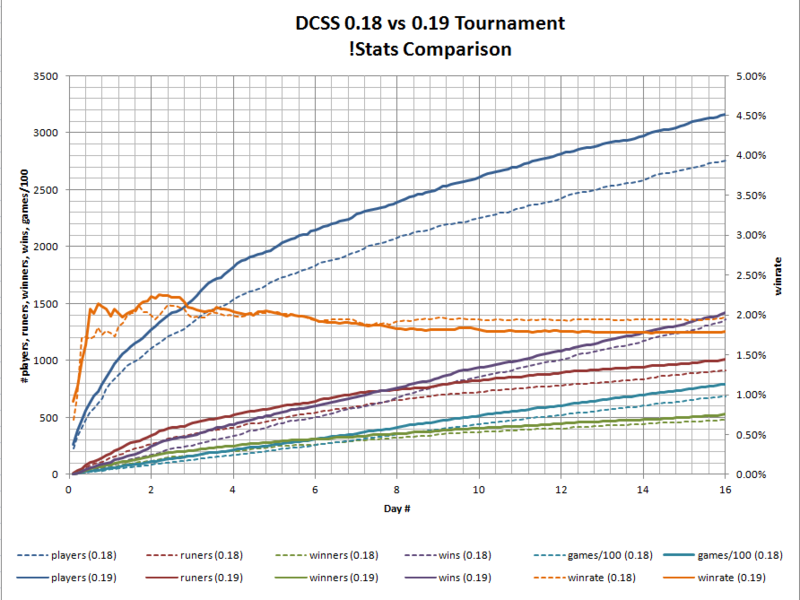 The 0.19 tournament has concluded. Courtesy of johnstein, here’s how we did this time around! Our champion is once again Yermak, winning 6356 points and 28 victories! Yermak was the champion of the 0.18 tournament, and with this win he joins Tolias as the only players to streak tournaments. Will a challenger oust him in the 0.20 tournament? The silver medalist is Ultraviolent4 with 5827 points and 20 victories. Ultraviolent4 also won the first victory of the tournament with a FoFi of Okawaru. Third place goes to p0werm0de with 5823 points and 21 victories, coming in only four points behind Ultraviolent4. Every point matters… p0werm0de also came in third place in the lowest-turncount victories, winning in 21912 turns with a DDFi of Makhleb. The best clan was Eublepharis macularius, with Charly (#5), SaintRoka, Sapher, Turgon, Yermak (#1), and pedritolo scoring 20,494 points and 68 victories. Second place was seized by Cleave Or Leave, with Leszczynek, Enish, kuniqs, murphy, p0werm0de (#3), and vev claiming 18,936 points and 54 victories. Third place is awarded to Drain the Swamp – End Corrosion in Spider’s Nest, with Ultraviolent4 (#2), Demise, PurpleRed, alcopop, edsrzf, and tabstorm gaining 17,246 points and 50 victories. The most commonly achieved banner was The Shining One’s Vow of Courage I, to kill Sigmund before entering the Depths, earned by a whopping 1636 players! The most rarely achieved banners, with only four bannerets each, was Vehumet’s Ruthless Efficiency III and Beogh’s Heretic III. The most dangerous ghost was Philosophy’s, killing 51 characters. Only twelve of these characters were named Philosophy. The most lethal monster in this tournament was the gnoll, of gnollcrawl fame, ending the hopes and dreams of 4849 characters. The most lethal unique was Sigmund, reaping 1943 characters. (That’s 1.19 kills per Vow of Courage I banner.) One player had his character slain by falling down stairs, another was ended by the capriciousness of Xom (two by Xom’s severe capriciousness), and one was paralyzed and killed by Sup Lies the pandemonium lord. Charly won the most efficient victory in the tournament, winning a DDGl in 13,275 turns and the highest score with 53562030 points. SpeedrunTech won the most quickly, winning a DDFi in 40 minutes and 18 seconds. AWBW II Turbo – Hyper Fighting captured the most high scores of any clan, with 38 high scores, ten more than second place, and also scored 7th place in the clan rankings. Dynast holds the longest streak of the tournament, with fifteen consecutive winners. His streak was beaten into submission by a hobgoblin, scoring 0 points. He held a truly absurd 94.12% winrate, significantly outpacing anyone with more than one win. Eight players scored a 100% winrate, each of them playing only one tournament game and winning that game. Over three thousand players participated! Amazing! A hearty thanks to everyone for coming together and participating in our community. And especial thanks to all our server administrators, developers, organizers, and contributors for putting in their work, time, and passion to make this tournament possible. P.S. If you haven’t filled out the survey, now is as good a time as any. Your feedback will help us improve Crawl! The 0.19 tournament will begin next week! From 20:00 UTC Friday 4 November through 20:00 UTC Sunday 20 November, any 0.19 game played on any of the online servers will count for the tournament. 0.19 will be officially released on the 31st of October. The rules page will contain all the details about how to score points and earn banners in the tournament. Veterans, take note of the new banners for Hepliaklqana and Uskayaw. Clans can be formed and changed until one week into the tournament. If you’re looking for people to play with, you can find them in the Tavern, reddit, Something Awful, or our IRC channel ##crawl on Freenode. Once the tournament has started, the tournament leaderboard will display the current standings. See you in the Dungeon!